Denon unveils additions to Design Series of hi-fi separates | What Hi-Fi? Denon's new range of hi-fi separates may be small, but they pack more options than some of their larger rivals. Denon has a new Design Series of hi-fi separates, and they certainly look the part. But they also boast an impressive amount of technology for your listening pleasure. As well as playing CDs, there's Bluetooth for wireless playback from a phone or tablet, and digital options for hooking up a cabled device, for example via USB. There are also analogue inputs and a headphone out, with gain control for adjusting volume. You can partner the DRA100 with the new DCD100 CD player (both pictured above). This plays CDs, CD-Rs and RWs, as well as WMA and MP3 digital files. There's a 32-bit/192kHz DAC onboard, as well both digital and analogue outputs, and it also has an OLED display. The DCD100 goes on sale in September, priced £500. The PMA30 amplifier features new digital amplifier technology, with two channels delivering 40 watts of power each. It supports 4ohm speakers and, like each product in the Design Series range, can be installed either horizontally or vertically. It goes on sale in September, priced £340. The DCD50 CD player (top of the stack pictured above) is the PMA30's intended partner. Featuring RCA and digital coaxial outputs plus the same 32-bit/192kHz DAC as its DCD100 sibling, the DCD50 can read CD audio, MP3 and WMA discs. It will cost £330 when it goes on sale in September. Want a step up? The PMA60 amplifier boasts 50W per channel and next-generation digital amp technology with DDFA. The USB input supports hi-res audio files, and there is Bluetooth aptX and NFC for one-touch pairing. It goes on sale in September and will cost £500. And finally, there is the D-M41DAB, a radio equipped with DAB, DAB+ and FM, which also plays CDs, CD-Rs and CD-RWs. 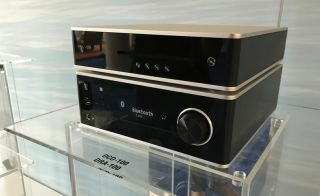 Bluetooth comes as standard, as does a newly designed analogue amplifier. Its two channels deliver 30 watts each, and the headphone amp has gain control for fine-tuning the output. It also has a 32-bit DAC built in, two optical inputs and a subwoofer pre-out. The D-M41DAB will be available this month for £280 without speakers, or £380 with.